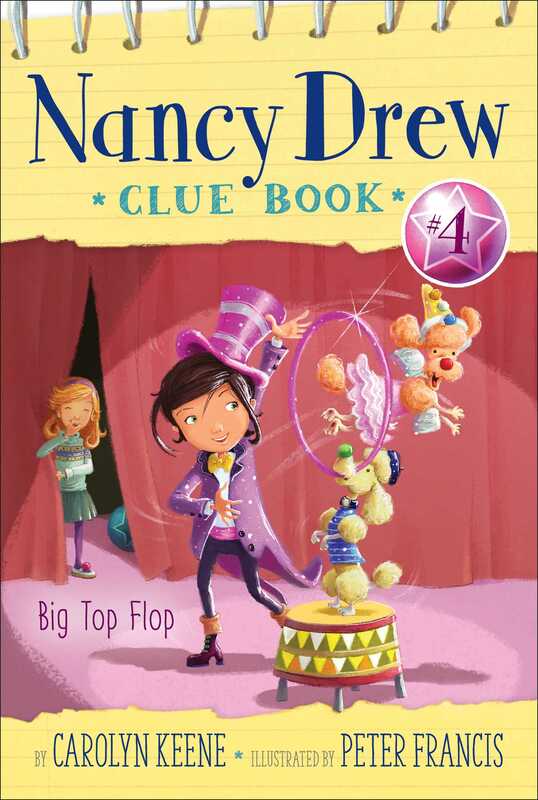 Help Nancy and her friends track down the crafty clown who stole George’s junior ringmaster whistle in the fourth book in an all-new, interactive Nancy Drew chapter book mystery series. Includes space for readers to jot down their own ideas and solutions to the case! The Bingle and Bumble Circus is coming to River Heights, and Nancy, Bess, and George are super excited to see the clowns, animals, and acrobats. But most of all, they’re excited about the Junior Ringmaster whistling contest! To win, all they have to do is be the kid who whistles the loudest and the longest. The winner of the contest will get to be Junior Ringmaster at the circus’s opening night and they’ll get a shiny silver whistle as a prize! After George wins, her friends can’t wait to see her in the show. But when the time comes, she blows and blows her whistle…and nothing comes out. When she checks her whistle, George realizes that it was switched with a broken one! Will Nancy and her friends find the whistle-snatcher before the circus leaves town? Eight-year-old Nancy Drew smiled as Bess twirled to show off her new outfit. Spring clothes and spring break were awesome. And there was one more thing about spring that she and her two best friends would totally agree on. . . .
Nancy, Bess, and George did agree on that. Each spring the circus came to River Heights Park. This year it came with something extra fun: a junior ringmaster contest by the big circus tent! “I whistled so loud that my puppy, Chip, ran under my bed,” Nancy said. “How was your whistling practice, Bess?” Nancy asked. It was Friday after school, so the girls still had their backpacks. George pulled a plastic bag from hers. Inside were yellow candies shaped like lemons. Nancy, Bess, and George turned. Standing behind them was Miles Ling from the other third-grade class at school. Everyone knew that Miles wanted to be a ringmaster when he grew up. He even owned a ringmaster suit and tall black hat, which he wore today! Nancy, Bess, and George stared at Miles. “Stuff your ears with it?” Nancy asked slowly. Nancy and her friends traded eye rolls. Miles may have been a good whistler, but he was also a very good bragger! George held out the bag. When Miles looked down at it his eyes popped wide open. “N-no, thanks. . . . I’ve got to go,” Miles blurted. He then turned quickly and disappeared in the crowd. “Do you think Miles was serious about stuffing cotton candy in his ears?” Bess asked. Nancy and her friends loved solving mysteries more than anything. They even had their own detective club called the Clue Crew. Nancy owned a notebook where she wrote down all her clues and suspects. She called it her Clue Book, and she carried it wherever she went. The girls turned to gaze at the big white circus tent with red stripes. Past the tent were rows of trailers. Nancy smiled as she remembered the circus from last spring. “Oodles of Poodles are the best!” she said. Nancy was about to answer when the crowd began to cheer. She turned toward the tent just as Ringmaster Rex stepped out, waving his tall black hat! “There he is!” Nancy said. “And his face isn’t blue!” Bess said with relief. Mayor Strong and more circus people filed out of the tent. Fifi and Felix Fabuloso marched behind their parents. The line formed lickety-split. The girls landed in the back with Miles right behind them. What happened? Nancy, Bess, and George stepped out of the line to see. A girl with curly blond hair had just pulled a giant squirmy spider from Lulu the Clown’s bag. But when she threw it on the ground—it bounced! Nancy frowned. No surprise there! “Let the contest begin!” Ringmaster Rex boomed. Nancy and her friends waited while other kids blew their whistles long and loud near the front of the tent. Finally it was their turns! Nancy gave her whistle a long tweet but stopped when her nose began to tickle. Bess blew her whistle until she got the giggles. Then came George’s turn and . . .
Everyone clapped their hands over their ears. George’s whistle was so loud that even the horses in the circus tent whinnied! George finally stopped to catch her breath. The crowd began to cheer. George was a whistling superstar! “Way to go!” Nancy cried as George hurried back. “You mean ‘way to blow’!” George joked. “We don’t have all day, kid,” Ringmaster Rex said. Miles stuck the whistle in his mouth. His chest puffed out, then, TWEEEEEEEEEEEEEEEE! Nancy gulped. Miles really was an awesome whistler. But would he whistle longer and harder than George? Miles’s eyes darted around as he whistled. But when his eyes landed on George they popped wide open. Suddenly—CLUNK—the whistle dropped out of Miles’s mouth. Miles’s lips began to pucker, then his whole face! The crowd laughed at Miles’s funny faces. Nancy had a feeling it wasn’t a joke. Especially when Miles stopped puckering and pointed angrily at George. Nancy turned to George, a Super-Sour Sucker lodged in her cheek.